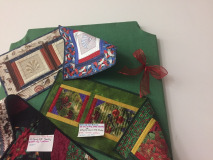 Participants will learn freezer paper applique by hand and basic machine pieced nine-patch. Then add a border or two and you will have a quilt top. You will finish your quilt top using basic machine quilting and then binding. For more information and list of supplies, call class Instructor Crystal Sweeney at 302-674-9030. $66 Sign up through Kent County Parks & Rec.